Jordan’s appointment with Dr. Roger Hudgins is a lot like playtime. I’m not sure if looking forward or anxiously awaiting is the correct phrase to describe how we felt going into our Myelo Clinic appointment in June. 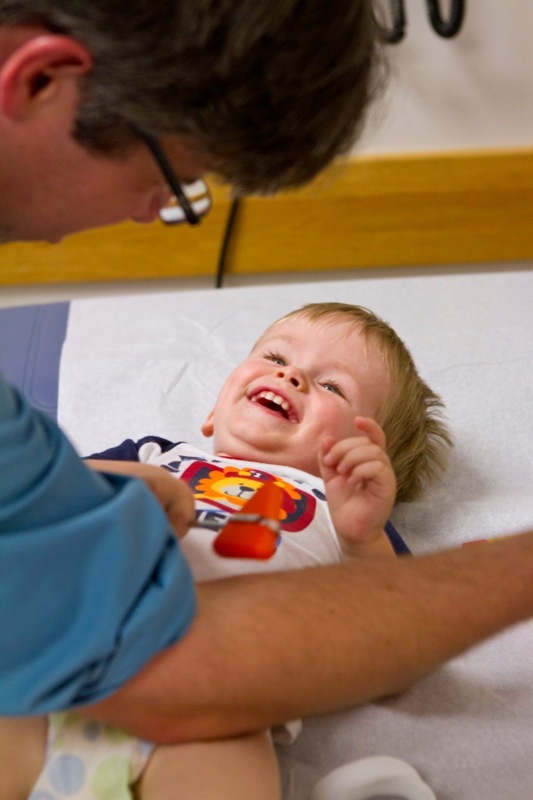 Our last was in December so we were ready to see what our doctors had to say about our little man’s progress. Looking back, so much has changed since December. I almost wish we had requested an appointment in between. Jordan has become much more mobile. 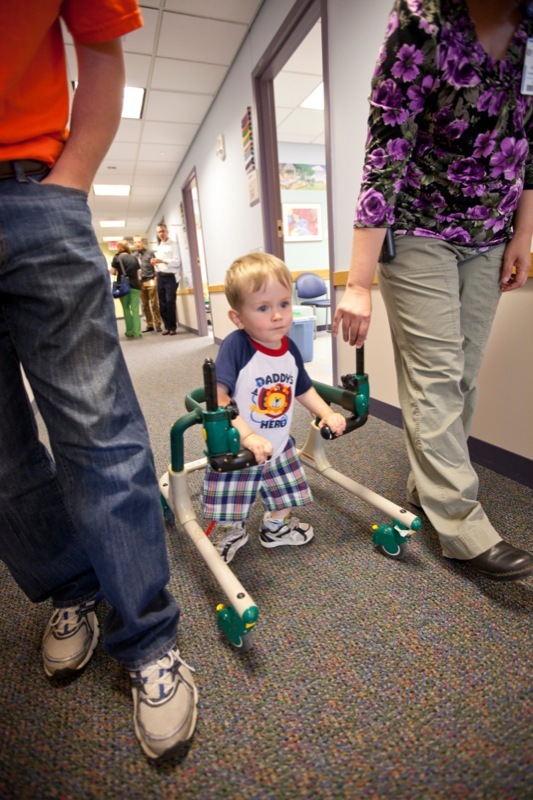 He crawls quickly down our halls, cruises around our furniture – from toys to chairs to his parallel bars – and when given the chance, uses a walker to assist with taking strolls outside. Dr. Kerwyn Jones assesses Jordan’s ankles and feet. We’ve been using SMOs (braces that hit just above the ankles), knee immobilizers and Kinesio tape on his feet to keep them in alignment to help him walk. Seems like a lot, but this little man gets excited to lace up his shoes around those braces so he can get moving. Our physical therapist suggested getting an x-ray of Jordan’s hips, knees and ankles to see what our next step should be in bracing. When Jordan is walking or gets tired, his right hip tends to want to externally rotate so his toes are pointed out. We were praying that his hip wasn’t dislocating, which is possible because of the weak muscles around his hip bones. So our first stop was Dr. Jones’ office. I wish I would have taken a picture of this little kiddo with his hands across his chest lying perfectly still for his x-ray. In fact the ladies were so impressed they rewarded him with one of his favorite snacks, Goldfish. Our next stop was radiology for a renal ultrasound. I always find it difficult to explain to Jordan that he needs to stay still to have these pictures taken because we encourage him to be on the move. We were pleased when Dalia, the nurse practitioner, and Amanda, our urology nurse, told us that everything looked good. His kidneys are growing as they should and the bladder isn’t showing any extra fluid. Dalia usually gives us extra sunshine when she enters our room. She’s full of energy, animation, and song. We have had the pleasure of Amanda being Jordan’s urology nurse since his NICU days. We are so thankful for her consistent care for Jordan. I was happy to hear that we would not currently be in need of a CAT scan. I know the little man would have had a difficult time being held down for this test, but Dr. Hudgins informed us that as long as he doesn’t have any complications we won’t need one for another year. I know I’ve said it time and time again, but we love our neurosurgery team. To the random person walking in, you wouldn’t even think it was an evaluation. The session consists of play and laughter. 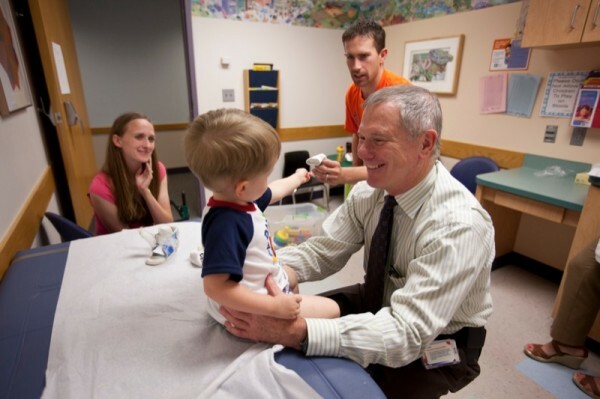 In fact my heart melted as Jordan reached over to Dr. Hudgins and hugged him. It’s like he knows this man saved his life. Holly, Dr. Hudgins’ physician assistant, has also been a constant. I feel like she handed me the keys to be Jordan’s advocate when we were in the NICU. We will never be able to bake enough cookies to thank our team. Our mobility team now consists of physical therapy, orthopedics, physiatry and orthotics. These specialists represent a true team model. Dr. Micah Baird evaluates Jordan. 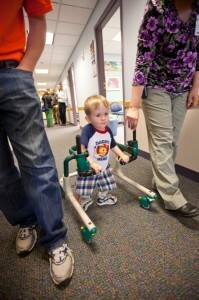 As Jordan cruised down the hall in his walker, they all were able to get a glimpse into his world. Of course he looked a little off, but that’s why I shoot little videos here and there. I love that they consult each other to see what the other feels is going to be best for Jordan at this time. I love each personality – from Dr. Jones, the orthopedics and sports medicine guru, to Dr. Baird, who brings his bag of tricks in for a good laugh. After consulting with each other and gathering information visually, we concluded that we will move Jordan back to an AFO. The kind that the orthotist is going to mold is called a floor reaction AFO that will help support his legs at his knees because of the lack of ankle strength. We hope that once we have his new super boots, he will be able to stand in more of an upright position, and in turn will help strengthen his muscles in the correct alignment. Now nerves have been put to rest for awhile as we’re able to focus on the next steps of our journey. As we lay our little man down after a 5-hour morning of seeing our heroes, we are able to rest easy knowing we can count on their expertise to support each other in helping Jordan be the best Jordan he can be. I’ve called many times to ask our Myelo Clinic coordinator Shannon about questions and concerns and she gives me encouragement and confidence. We love our entire team and could not be more grateful to have them monitor our Peanut. God has truly blessed us!